Rollo has selected a row of text in the source component: the list. While holding the mouse button Rollo begins to drag the text — this initiates the drag gesture. 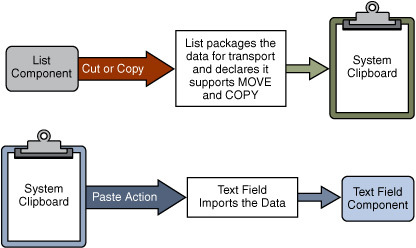 When the drag begins, the list packages up the data for export and declares what source actions it supports, such as COPY, MOVE, or LINK. As Rollo drags the data, Swing continuously calculates the location and handles the rendering. If Rollo simultaneously holds the Shift and/or Control key during the drag, this user action is also part of the drag gesture. Typically, an ordinary drag requests the MOVE action. Holding the Control key while dragging requests the COPY action, and holding both Shift and Control requests the LINK action. Once Rollo drags the text over the bounds of a text field component, the target is continually polled to see if it will accept or reject the potential drop. As he drags, the target provides feedback by showing the drop location, perhaps an insertion cursor or a highlighted selection. In this case, the text field (the current target) allows both replacement of selected text and insertion of new text. When Rollo releases the mouse button, the text component inspects the declared source actions and any user action and then it chooses what it wants out of the available options. In this case, the text field chooses to insert the new text at the point of the drop. Finally, the text field imports the data. While this might seem like a daunting process, Swing handles most of the work for you. The framework is designed so that you plug in the details specific to your component, and the rest "just works". We do not recommend that you create your own drag and drop support using the AWT classes. This implementation would require significant complex support internal to each component. Prior to release 1.4 when the dnd system was reworked, developers did occasionally create their own dnd support, but it does not work with sophisticated components, like tree and table, that have subtle selection and drop issues.